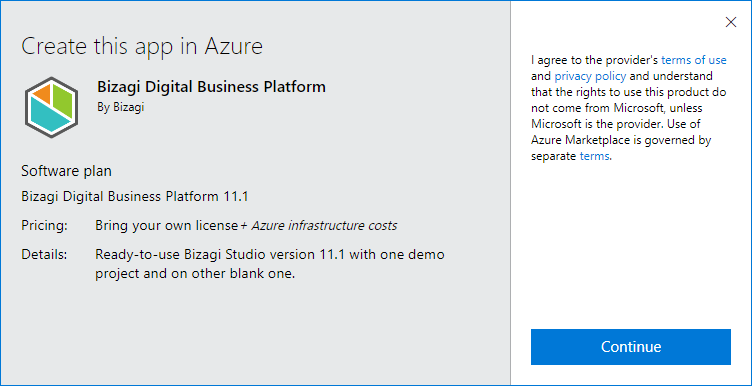 This article illustrates how to easily evaluate and explore Bizagi Studio and all of its features using our offering published in Azure Market Place. Start using Bizagi Studio without having to download it or carry out any installation or configuration steps. 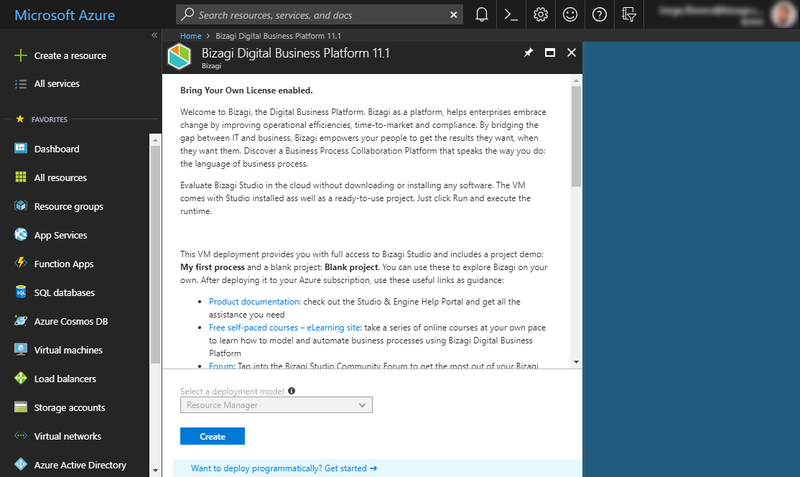 The option presented in this article is designed to help you get started with Bizagi Studio in particular, by setting you up with your own virtual machine with a ready-to-use Development environment. 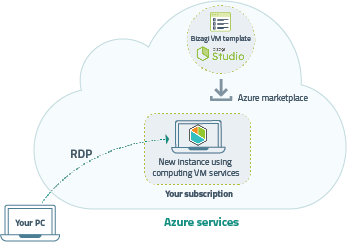 By using Bizagi's offer in Azure Marketplace, you will have an Azure virtual machine, with Bizagi Studio already installed and pre-configured. Bizagi Studio by itself, bundles the runtime environment, or Work Portal, that lets you test and run your processes implementation in real time. You can carry out quick prototyping and verify how your end users would use Automation Server on a Production environment. 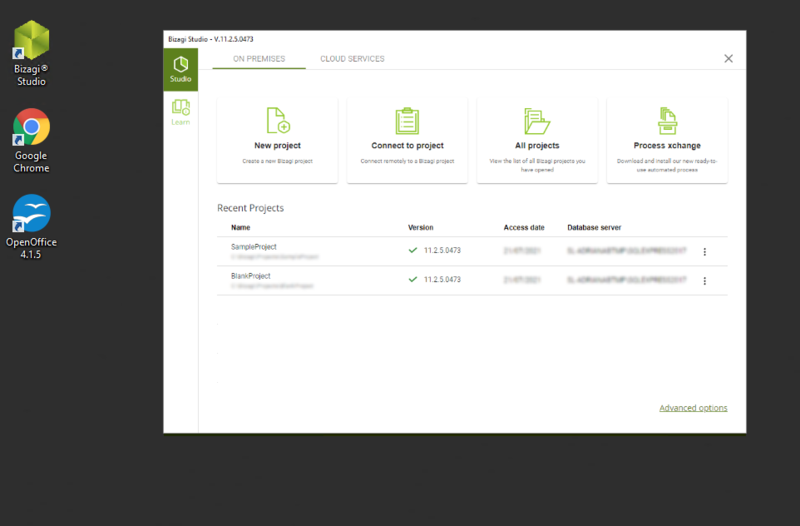 The offering includes a sample project to use in the Work Portal so you can quickly test-drive how Bizagi works without having to do any development. 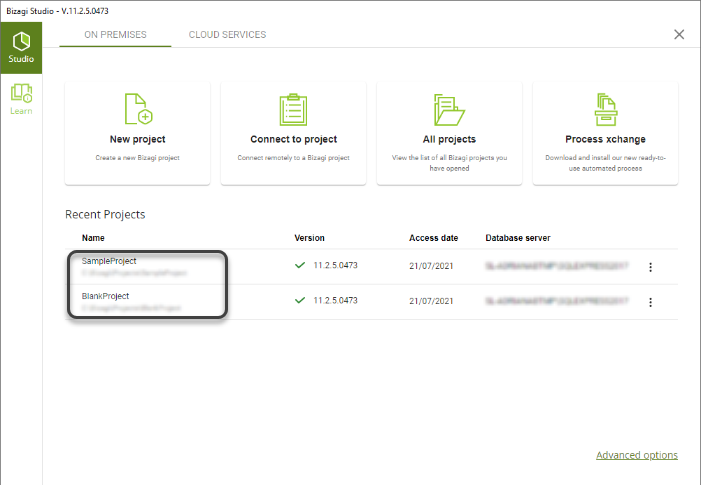 Additionally you can use the pre-created blank project to start building your own business processes. We recommend following the My First Process guide to get you started. Though you may choose to use virtual machines for a Production environment of Bizagi, this specific virtual machine template is for evaluation purposes only. it is not designed for a Production environment. You need an active Azure subscription. When you subscribe to a free trial, Azure requires credit card information. You will not be charged and the free trial end will not automatically move to a charged plan when it expires (though you may verify settings regarding this). 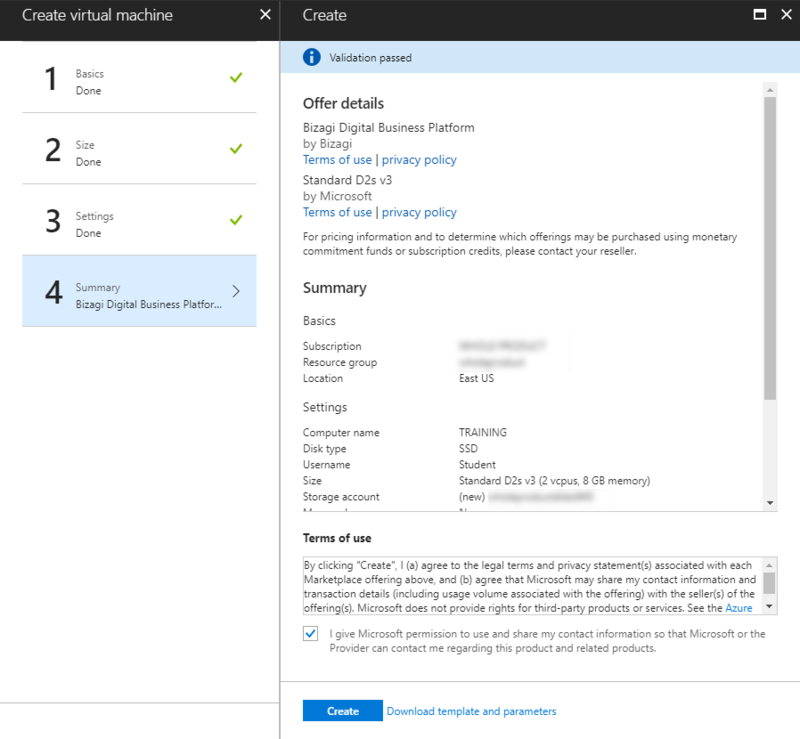 For further information, refer to https://azure.microsoft.com/en-us/pricing/free-trial/. 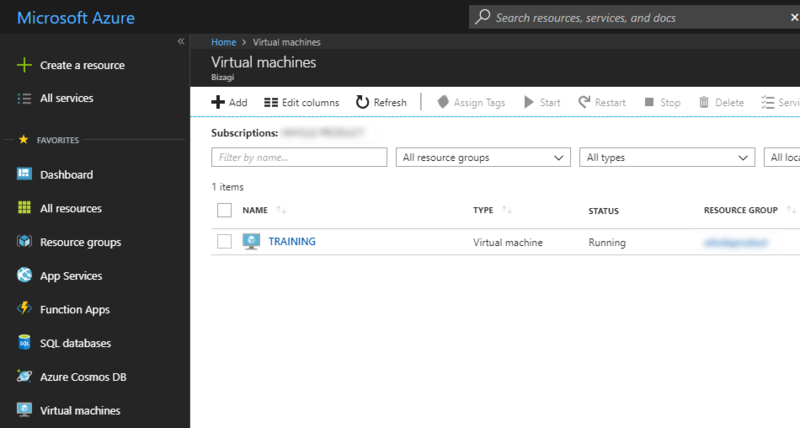 Through this approach, you create an instance of a virtual machine bound to your Azure subscription with minimal configuration (a full deployment of a virtual machine directly in your Azure deployment). Once this is set, you can manage and configure further settings for this virtual machine (such as the world-wide region where this is stored). 1. Sign in to Microsoft Azure. 2. 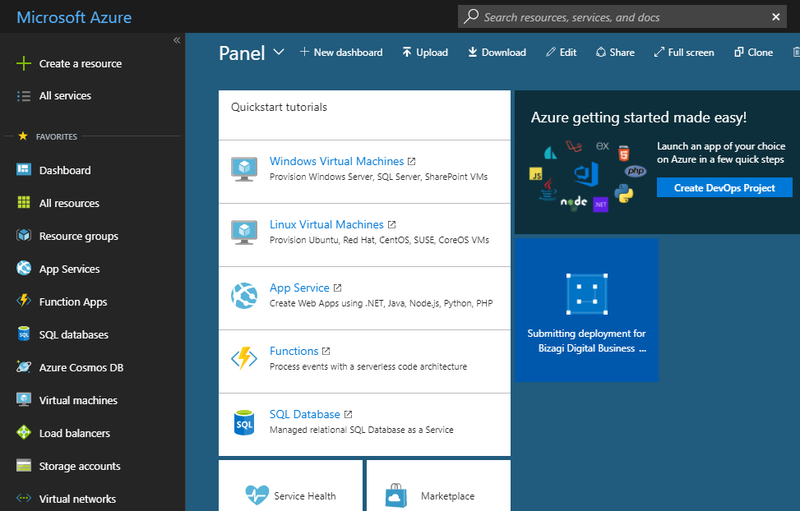 Locate the template for Bizagi in Azure Marketplace. 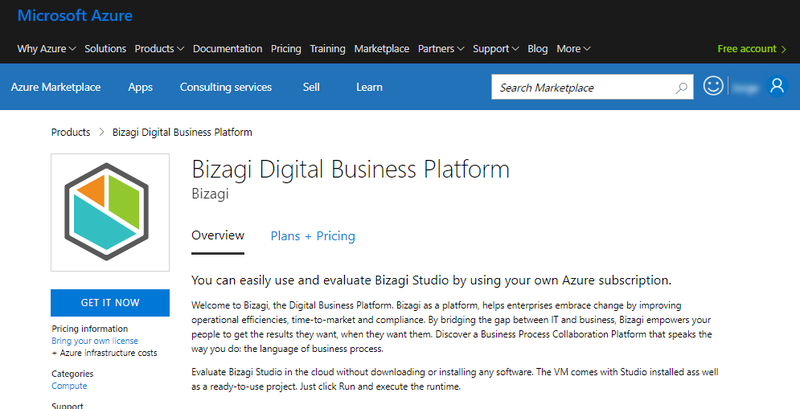 Access the Marketplace and locate Bizagi's virtual machine template at https://azuremarketplace.microsoft.com/en-us/marketplace/apps/bizagi.bizagibpms. 3. 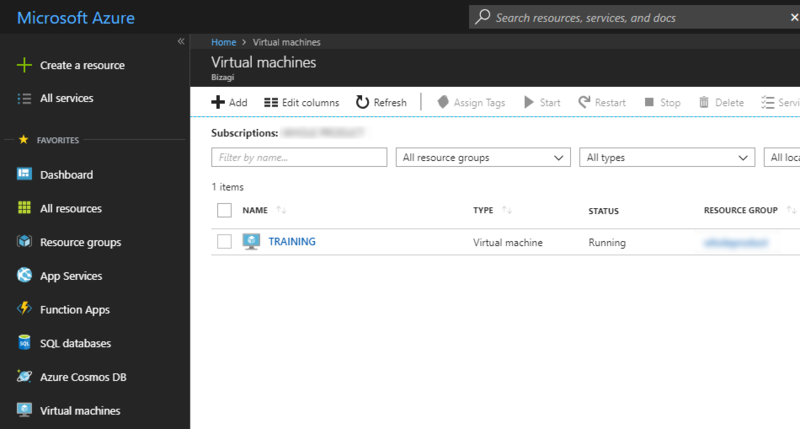 Create the instance for the Virtual Machine. 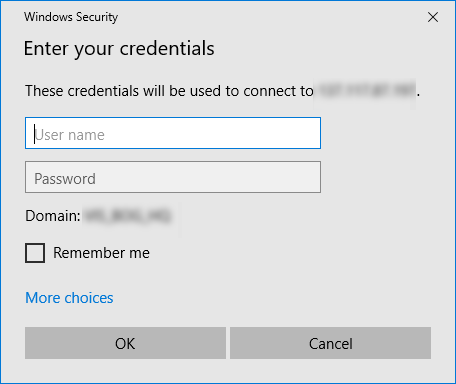 Provide a Name for your machine, a User name and password. Also include the Resource group information. 5. Choose the hardware sizing for your machine. You can use a D2s_v3 which meets the minimum requirements for Bizagi Studio. Click D2s_v3 and click Select. This step is entirely optional as the default Standard disk type meets the minimum requirements for Bizagi Studio. 7. Confirm the creation of your virtual machine. Once the process finishes, the virtual machine is provisioned and you can see it listed under your Virtual machines menu option. Once the Bizagi virtual machine is provisioned, connect to it by locating the virtual machine and clicking it. Click Download RDP file. 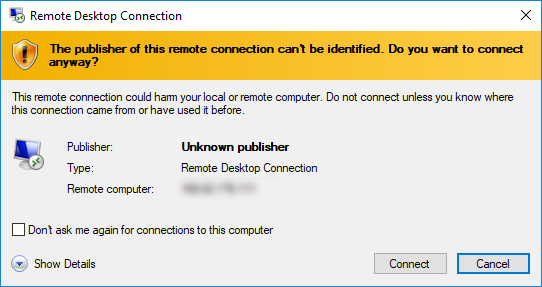 This action downloads the Remote Desktop Connection link. 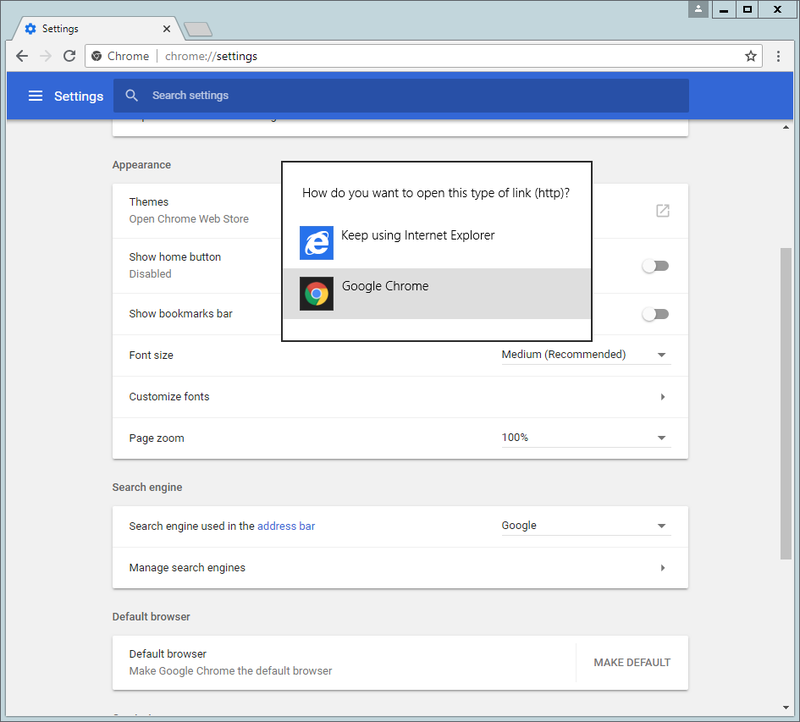 This virtual machine has Internet Explorer 11 as its default browser. We strongly recommend switching to Google Chrome, which is installed by default. •Product documentation: This online help which presents how-to articles and describes features. Find the product documentation at http://help.bizagi.com/bpm-suite/en/. •Process documentation: This document features a description of the process in SampleProject, which is already available in the virtual machine. •eLearning site: Free self-paced courses available online which walk you through a learning journey on how to model and automate business processes. •Forum: Features the Bizagi Studio Community Forum so you can get the most out of your experience with Bizagi. Share experiences and post questions at http://feedback.bizagi.com/en. What does this virtual machine include? 1.BlankProject: A ready-to-use blank project for you to start your own implementation from scratch. 2.SampleProject: A sample project using the "Vacation Request" as an example of how to implement processes. 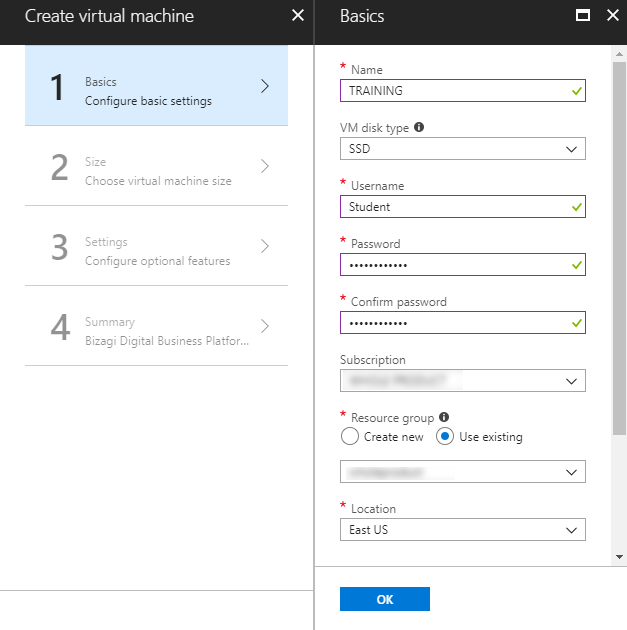 This virtual machine template is not configured to allow team collaboration (this may require further configuration in your specific Azure subscription and infrastructure services). It is designed for single users who want to evaluate Bizagi. At any time you can recreate the state and progress of the Bizagi project in this virtual machine, into a different machine of your choice (in the cloud or locally), by creating a database backup of this Bizagi project and restoring it into your other machine with a similar setup. 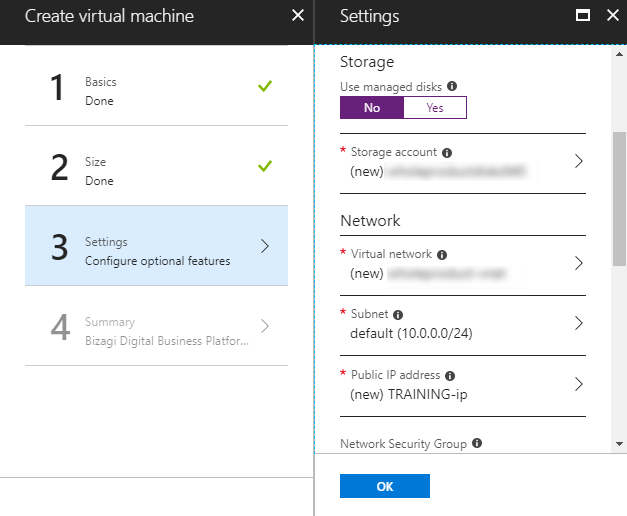 This offering relies on Azure services (computing services that host virtual machines, as described at https://azure.microsoft.com/en-us/services/virtual-machines/).